← A little sumpin’ sweet. I love magazines. I mean, I really love them. I subscribe to over a dozen of them. I have a problem with magazines. I cut out recipes, exercise ideas, etc, and then keep those stacks for months until I put them in the organized binder I have. Then, that binder just sits around, while I hardly ever make the recipes from those magazines. Then, I started to read blogs. And now I bookmark blogs, email blog links to my email, star blogs in google reader, and do screen shots of some recipes. And guess what… I never make those recipes, or do those crafts or house decorating, or exercises, either. I had a ritual with the magazines. Saturday mornings, I would get my coffee, and sit on the couch catching up on DVR and read my magazines that had piled up in the foyer all week. I would get through them, then move on to Google Reader and read my blogs. But, now, I am backlogged. I subscribe to so many blogs, and so many magazines, I think I am in a permanent state of stacks of stuff to read. This, is in addition, to the list of books I want to read, and am reading. The thing is..this backlog doesn’t make me nervous, it comforts me. And THAT makes me nervous. That is the mind set of a hoarder. I have to constantly fight hoarding tendencies. My husband said I have a problem being overly sensitive to being a hoarder, but that show scares the crap out of me. 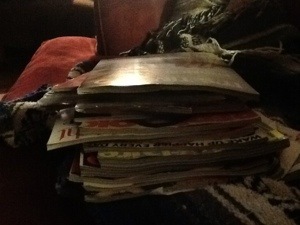 So, tonight, my goal is to get through some of the magazines. (I get rid of them immediately after reading them.) 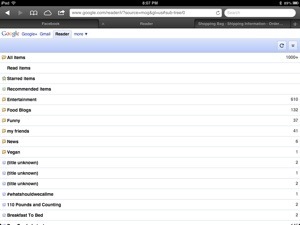 And, to make a dent in my google reader. My goal should be to start cleaning for my Halloween Party tomorrow, or make a menu for the party, or walk on the treadmill. But, after this crazy week at school capped off with a Halloween party at school that lasted a long time, I am spent. I hope you are all enjoying your Friday night. Anybody else fight hoarding issues?? This entry was posted in Uncategorized and tagged blogs, bookmark, friday night, google reader, halloween party, hoarding, magazines. Bookmark the permalink. 1 Response to Hoarding. Magazine Edition.